Hey, ladies. I'm back! Sorry for being so MIA but after a weekend of music and camping, I came down with the flu for the better part of the week. Not so fun! So to make up for my absence and to celebrate the 4th Anniversary of Ask Away Blog, myself and a bunch of awesome bloggers have teamed up to give you an awesome giveaway... $80 IN PAYPAL CASH! 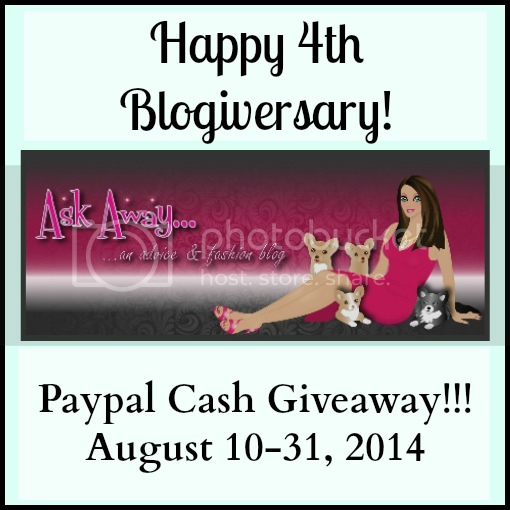 To celebrate Ask Away's 4th Blogiversary I've teamed up with some fabulous bloggers to bring you a CASH GIVEAWAY! What would you do with an extra $80 in your pocket? !